Here are just some ways you can add real wow-factor to your pharma exhibition stand. Technological advancements are giving pharma exhibition stand designers more and more ways to meet your objectives (while showing off their creativity!). Video projections, music and virtual reality are all being used to grab attention. Colour catches the eye and bold shades can help an exhibition stand to captivate passers-by. Just make sure that your design doesn’t become so busy that your overall message gets lost. You also don’t want to give visitors a headache! Lighting has long been used to add wow-factor to pharma exhibition stands and this trend is continuing. Where extra impact is needed, bespoke lighting solutions are helping to express individuality. Neon-like LED, lightboxes and illuminated shelving are all popular with organisations looking to maximise impact at tradeshows. Want to create different perceptions of depth? Why not use mirrors to help grab attention? For example, adding a mirror to the roof of your pharma exhibition stand can be a creative way to make a smaller space look huge. Height and suspended elements can also make your displays work harder in areas with a small footprint. The ambience of exhibition stands can influence how people perceive a brand. So, to create an elusive experience, pharma stand designers are now looking at more than how a display looks - they are also focusing on how it feels. As such texture and interesting materials are becoming an essential part of exhibition stand design. For added creativity, scent is even being used to create a welcoming and positive environment. In some industries - such as pharma - there is a backlash against design that looks overly corporate or flashy. In response, exhibition stand designers are using colours, materials and lighting to create more authentic exhibition stand experiences. For example, if you want someone to get a feel for your products, you could build a replica of the exact space they would be used in. How your stand looks is vital when it comes to communicating who you are and what you do. But, by adding things like comfortable seating and attractive displays, you can turn your stand in a place to visit rather than just a huge billboard. Interactive features can also help to make your pharma stand more engaging while sparking those all-important conversations. Having a great stand is essential to exhibition success. And, because they are designed specifically around your products and services, our bespoke exhibition stands are not only unique, they also grab attention. 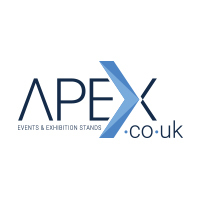 At Apex we use smart design, unusual 3D shapes, bold colours, exciting materials and the creative use of space to really help you to stand out. Crucially, if you have a smaller space our custom exhibition design also punches well above its weight. A specialist supplier to the healthcare and pharmaceutical industries, we understand your communication goals. And, through creative exhibition stands, product launches, sales conferences, awards dinners, and PR events, we help you meet them. Our Exhibitions and Events teams have industry-specific knowledge and work in synergy with each other, and seamlessly with your other approved agencies. We work in all healthcare areas including ethical pharma, OTC and retail products, primary and secondary care communications, R&D and clinical trial events, nursing and NHS commissioning. Contact us today on + 44 (0)1625 429370 to discuss your requirements in more depth. FIND OUT MORE ABOUT OUR EXPERIENCE IN HEALTHCARE & PHARMA.